Victoria sponge is a prissy and silly dessert. However, it is fantastically good. I imagine British snobs to eat it while drinking tea out of bone china cups. It does require some skill however. The butter and sugar need to be whisked together, not beaten. And the only way to get a spongey texture is by folding in the flour by hand, using the folding in method. Now that is not an easy task even when you have normal hands, but when you have slight arthritis in your fingers, the job becomes particularly laborious. But the result was totally worth it. The sponge looked and tasted perfect. However, this did not go without a glitch. Since my hands were so tired after all the folding in, I decided to make the whipped cream using the whisk utensil on my food processor. While this was going on, I split the sponge in two in order to make 2 layers. I do not have a cake knife, so this turned out to be a slight disaster, the layers were completely uneven. I used them anyway. 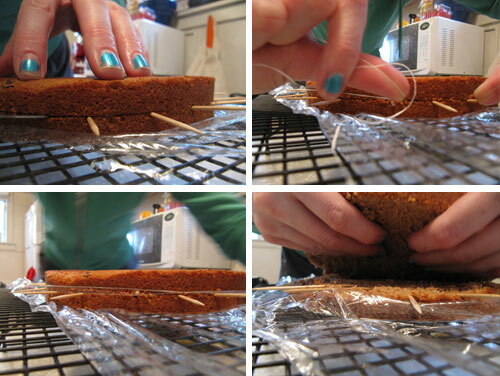 I now know there is a very simple way of doing this using toothpicks and dental floss. I started to spread jam on one side of the cake and I started day dreaming about what a happy little chef I am, making upper-crust desserts for my husband and I drifted off to this whole housewife fantasy, which I know would not work out anyway because I get majorly bored and my carreer is a big part of my identity, when I remembered that the cream had been being whisked the entire time. When I checked my food processor, sure enough, my cream had been churned into a kind of buttery cheese. It was positively disgusting. Ah well. Begin again. The second time I was careful and all turned out just fine. I dusted the top with some icing sugar, decorated with strawberries and it was complete. Ta Daaaaaa!!!! August 13, 2010 marie-claire p.